Three more fighters join the fray. 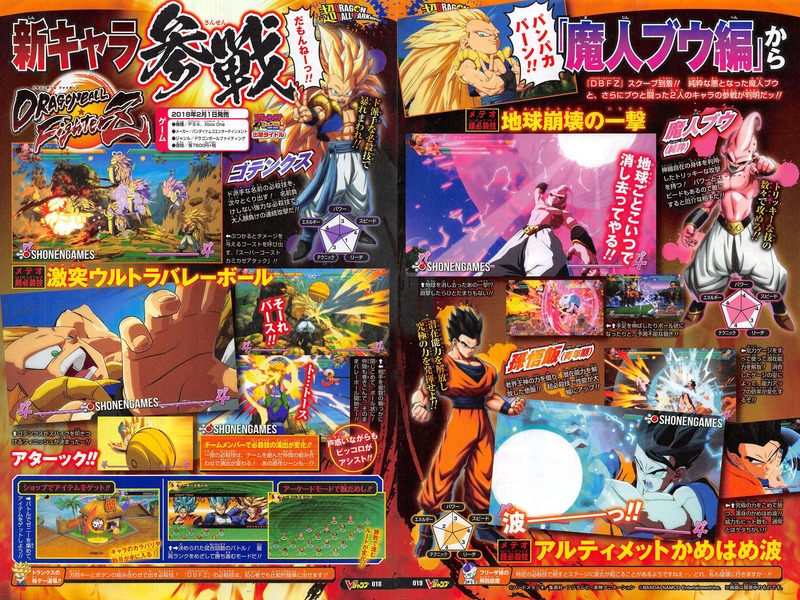 Gotenks, Kid Buu, and Adult Gohan will be playable in Dragon Ball FighterZ, the latest issue of V-Jump reveals. Shop – Players will be able to purchase character color variations and titles by spending the Zeni earned in battle. Arcade Mode – Fight a predetermined number of battles. The route will change depending on whether you win or lose. Update 8:40 a.m.: ShonenGamez has posted a scan, providing us more information. The scan has been added above. Get the details below. Unleash special moves with extremely flashy names one after the next! Continuous attacks that put adults to shame, with powerful special moves that don’t fail to live up to their name. Use the “Super Ghost Kamikaze Attack” to summon ghosts that deal damage upon impact. Use the Meteor special attack “Charging Ultra Buu Buu Volleyball” to imprison your opponent within multiple rings in the shape of a ball. From there, one of your team members will jump in and start playing volleyball. Finish it off with a spike! The scenes for some of Gotenks’ special moves will change depending on the combination of team members. Kid Buu has tricky attacks that make use of his elastic body. Since he has both power and speed, he can be a troublesome foe. He has unpredictable movements, such as stretching into the shape of a ball. His Meteor special attack is “Planet Burst”—that attack that destroys the earth. The opponent stands no chance once it hits. Borrowing the power of Old Kai, Gohan unlocked his potential. With special attacks, his abilities have significantly improved. Use all of the Ki Gauge to unlock your potential! Depending on the amount of the Ki Gauge consumed, the magnification of Gohan’s abilities increase will change. Gohan’s Meteor special attack is “Ultimate Kamehameha.” Neither its power or number of hits can be compared to the regular Kamehameha.